Spreadsheets created in Microsoft Excel 2013 rarely print how you want them to by default. This will lead to adjustments of many of the page elements that affect printing, and might even include the insertion of manual page breaks. But if you start to modify the rows, columns, or individual cells in your worksheet, then you may find that your manual page breaks result in some strange printing behaviors. Going back and adjusting these manual page breaks can be frustrating, so you might decide to simply remove all of the page breaks and start over. Our tutorial in this article will show you the steps to take to reset all of your worksheet’s page breaks. The guide below will assume that you have a worksheet in Microsoft Excel 2013 that contains manual page breaks, and that you wish to remove all of the page breaks and reset to the page breaks that occur by default. If you follow our steps below and do not see a “Reset All Page Breaks” option, then there are no manual page breaks in your worksheet. If your worksheet is printing strangely without page breaks, then there may be a defined print area. 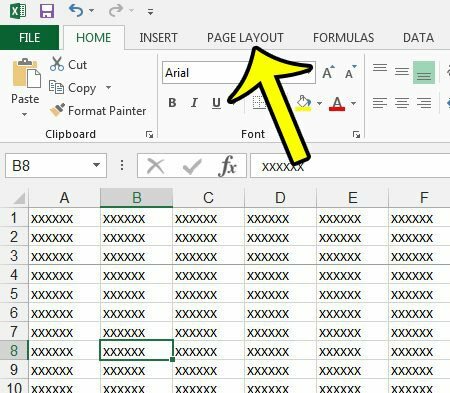 Learn how to clear a print area in Excel 2013. Open your file in Excel 2013. Click the Breaks button in the Page Setup section of the navigational ribbon, then click the Reset All Page Breaks option. 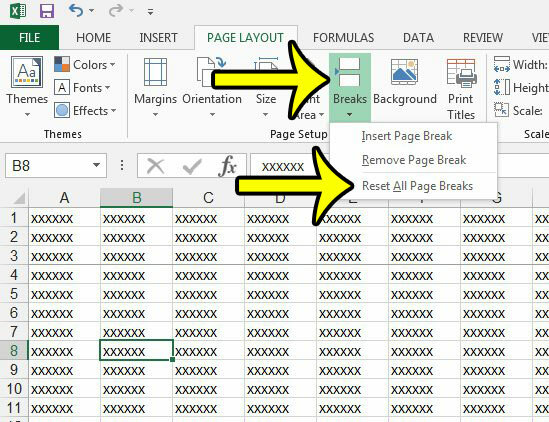 Removing page breaks in Excel 2013 is done at the worksheet level. If you wish to remove page breaks from multiple worksheets, then you will need to do so to each sheet individually. There are many settings in Microsoft Excel 2013 that can affect the way your spreadsheet prints. One settings that is commonly adjusted are the gridlines or borders that visibly separate your cells. Learn how to print without cell borders or gridlines in Excel 2013 and see both of the settings that can affect the printed lines.